Ho Chi Minh City’s authorities want to enhance cooperation with France in the fields of the country’s priority and strength such as smart city development, urban management, finance-banking, logistics, trade and tourism, said Chairman of the municipal People’s Committee Nguyen Thanh Phong. During a reception for a delegation of leaders from French enterprises led by Francois Corrbin from Michelin Group on November 4, Phong said HCM City hopes to have more specific projects and investment cooperation programmes of the French government and enterprises for local start-up community, especially in technology. He briefed the French guest on HCM City’s socio-economic development, and highlighted the fruitful development of the Vietnam-France strategic partnership. Mutual visits made by the two countries’ high-ranking officials in 2018 have contributed to lifting the bilateral relations to a higher level, he affirmed. Phong also asserted the municipal authorities’ commitment to working with foreign enterprises and investors operating in the city. 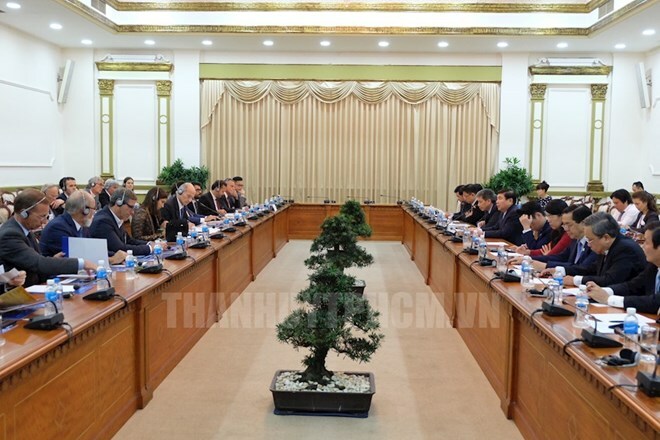 He expressed his hope that the French side will promote the completion of necessary procedures for the official signing of the free trade agreement (FTA) between the European Union (EU) and Vietnam (EVFTA) and the EU-Vietnam Investment Protection Agreement (IPA) in late 2018, and ratification of them in early 2019, thus realising great opportunities brought by the EVFTA, towards benefiting the two countries’ business communities. For his part, Francois Corrbin affirmed the French government always respects the close relations with Vietnam, especially HCM City. In recent year, the two sides have made great achievements in their cooperation in culture and education; however, their bonds in investment and trade are yet to match potential, he noted. The guest said the French PM’s visit to Vietnam, with the participation of representatives from French government agencies and leading groups, shows France’s appreciation of its relations with the Southeast Asian nation, especially in the fields of economy, trade, and development cooperation. French businesses wish to explore investment and cooperation opportunities, and are willing to support and join HCM City’s development, particularly in hi-tech application in maritime economic development, infrastructure development and water treatment, he said./.